There is nothing quite like the taste of home – especially when you live on the International Space Station. For ESA astronaut Alexander Gerst that taste comes in the form of chicken ragout with mushrooms, or lentils spätzle and sausage, specifically developed by Lufthansa chefs for maximum flavour and a long shelf-life. 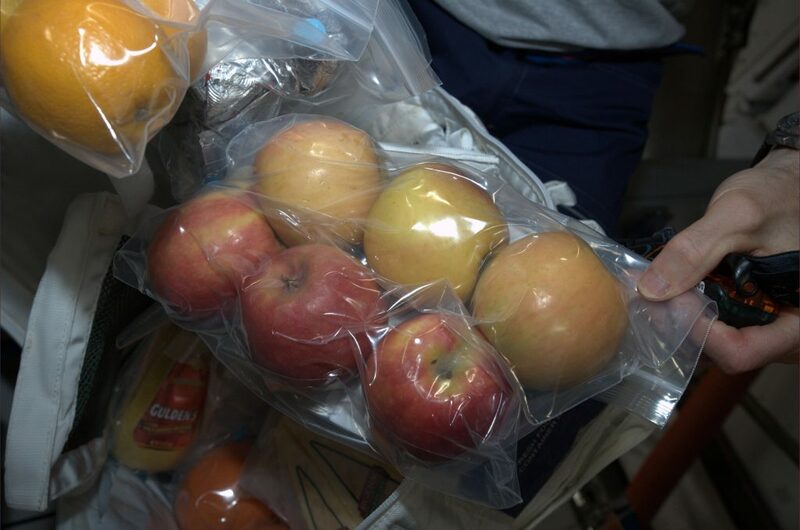 Fresh fruit is a luxury on board the Space Station. Credit: ESA/NASA, CC BY-SA 3.0 IGO. To make it on board the International Space Station, food must be crumb-free, light-weight and keep for at least 18 months without preservatives. For future missions to Moon and Mars, it will need to last even longer. One of ESA ‘s goals is to create a closed life-support system, including water recovery and food production, that will support astronauts in space indefinitely without costly supplies from Earth. This kind of technology could also be used to aid communities on Earth whose access to food, water or clean air is scarce. ESA crew support Susanne Altenburger says food developed for specific crew members and missions – like Alexander’s chicken ragout, or the French New Year’s Eve dinner of Thomas Pesquet’s Proxima mission – makes up around 10 percent of an astronaut’s food allocation in space. Development of these dishes starts anywhere from a year and half to two years before a mission. “We start selecting meals and testing well in advance because, as well as being approved by the astronaut, meals must be sent to the lab for safety and nutritional testing, after being freeze-dried, thermostabilised or vacuum packed,” Susanne explains. Processing reduces the likelihood of foodborne illnesses and extends the food’s shelf-life. Meals are then sent to NASA’s Johnson Space Center in Houston, USA, and must arrive months in advance of the next cargo vehicle launch. With a full schedule of science and operations, as well as the impact of microgravity on bone density, muscle tone and nutrients, it is vital an astronaut’s daily diet contains the fuel they need. Developed by France’s CNES space agency and the MEDES Institute for Space Physiology and Medicine for Thomas’ Proxima mission, ESA’s tablet-based app called EveryWear allows astronauts to record their calorie and nutrient intake by selecting items from a list or scanning barcodes on food packaging. ESA Biomedical Engineer Andreas Lundt is part of the team behind the app and says further features – such as an advanced search function – will be implemented for ESA astronaut Luca Parmitano’s Beyond mission, with more development to come. ESA astronaut Paolo Nespoli using the Everywear app. Credit: ESA/NASA, CC BY-SA 3.0 IGO. “Right now, data is sent for analysis to a nutritional specialist on the ground who provides nutritional reports and recommendations to the astronauts, but for missions to the Moon and Mars this would take way too much time,” he explains. A mission to Mars will take two to three years minimum. And, with no resupply vehicles available to replenish astronaut provisions, food either needs to go the distance or be grown in space. 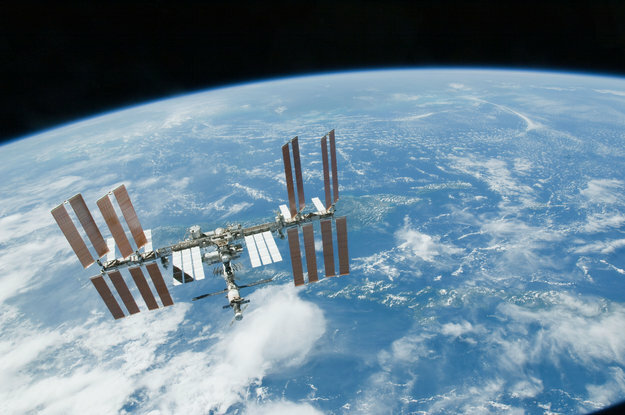 Alexander recently installed ESA’s new Advanced Closed Loop System in NASA’s Destiny Lab on the Space Station. This system recycles carbon dioxide, turning it into oxygen and reducing the need to extract it from water sent from Earth. Alexander Gerst installing a new life support system in NASA’s Destiny lab. Credit: ESA/NASA. ESA is also working to finely tune how microbiological cells, chemicals, catalysts, algae, bacteria and plants interact, and how we could process waste to deliver never-ending fresh supplies of oxygen, water and food. It is all part of ESA’s vision for greater sustainability in space and on Earth. Find out more about food and nutrition on board the International Space Station in this brochure.